Create a sense of community and identity among the men in the congregation by providing, encouraging and supporting opportunities for men to get to know one another by doing things together, whether social, educational, service or spiritual. 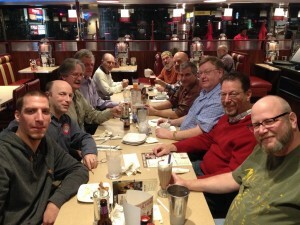 Each month the Men of CSS meet at a local restaurant for dinner. You don’t have to be Jewish to join in the Men of CSS activities. All men are welcome! The purpose of the dinner is to provide an opportunity for the Men of CSS to get to know one another. There will not be any business conducted at the dinner, no committees or work details, just fun and good conversation. Last month’s dinner was a great success. The only thing we were missing was you. There is no cost to RSVP. Dinner and drinks will be on separate checks to each individual. I hope each of you will give this a try and I look forward to meeting you at the dinner. Send Mark your name and email and he’ll be sure to include you on the invite for the next dinner.